Since 1991, Stella's has been one of Denver's landmark coffee houses — a refuge for students, worker bees, neighbors and families. Stella's occupies an expansive house on Old South Pearl Street, built in 1945. Its atmosphere is cheerful and eclectic, with a wraparound porch, quiet nooks, local art, stocked bookshelves, and a large room for live music. A diverse menu of espresso drinks, coffees, whole-leaf teas and snacks means there's something for everyone. 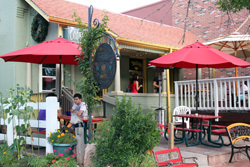 Its loyal customers have helped it achieve honors as "Denver's best" in various local publications through the years. This shirt features an image of the handmade wooden sign that stands outside Stella's front door, often linked by leash to a neighborhood pup waiting for its owner.